We are a noteworthy Exporter, Stockist and Supplier of high quality Stainless Steel Shackles. Stainless Steel Shackles, available with us, are made with premium raw materials, such as stainless steel, mild steel, etc. 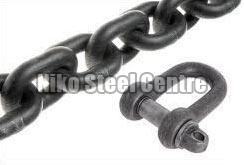 The Stainless Steel Shackles are known for their excellent durability and robustness. The Stainless Steel Shackles are in huge demand all over the world.